I had no idea what to expect. He cracked open the doors to the cabinet where he stashes stuff. His stash varies. Sometimes he puts little drums in there. Sometimes it’s full of spices and cooking utensils. Last night he pulled out a shoebox. He slowly opened it to reveal a collection of coins, shells, marbles and magnetic letters that usually reside on the fridge. He was beaming. I never tire of collecting and saving things. Or noticing things collected. I guess these guys come by this appreciation naturally. 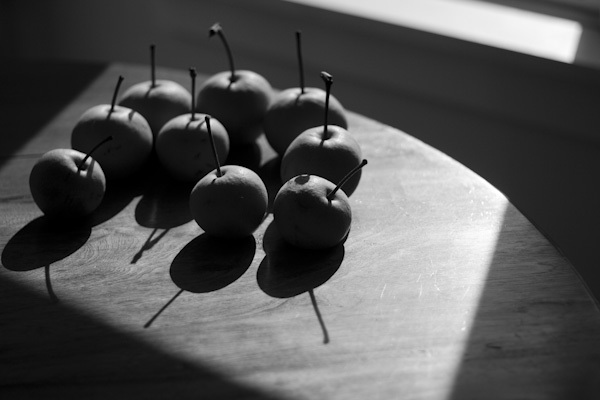 A few days ago, I walked through the sunroom and was struck by a gathering of Asian pears on the table. We’d had a party the night before, so I have no idea who put them there. But thanks…it made me happy. This entry was posted on Thursday, October 29th, 2009 at 9:10 pm. 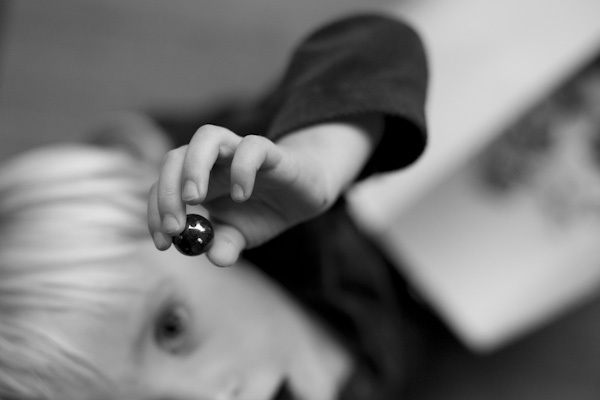 It is filed under family, found and tagged with labarge, oregon, photojournalism, portland. You can follow any responses to this entry through the RSS 2.0 feed.